Tattoo painting is a very popular form of body art these days. Although it has been known to human beings since centuries, nowadays, it has gained a lot of acclaim worldwide. Tattoos are one of the most sought after things for both men and women. Most people have tattoos painted on their body parts simply to make a fashion statement, whereas, some people have tattoos for its significance or to express the meaning associated with it. 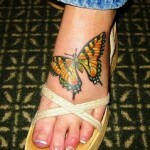 The butterfly is a feminine tattoo design, and hence, is flaunted mostly by women. Butterfly tattoos look pretty on any part of the body. But, they are commonly painted on the feet of women. What does a butterfly symbolize? One may not know, but, several distinguishing and noteworthy qualities are related to the modest looking butterfly. 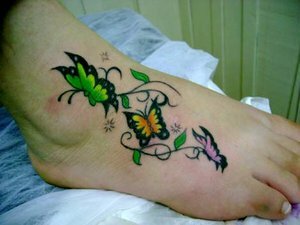 A butterfly tattoo design is feminine, it signifies beauty and grace, and hence, is a hot favorite among women and young girls. As butterfly represents metamorphosis or transfiguration, many people have these tattoos to represent change. Sometimes, people also have these tattoos when they are about to begin a new chapter in life, like marriage or a new career. 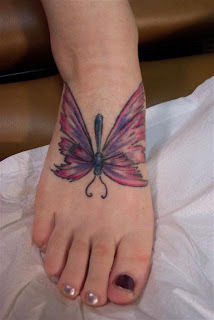 Another most important symbolism of the butterfly tattoo is freedom and the carefree life associated with it. It is also believed to symbolize magic and luck. 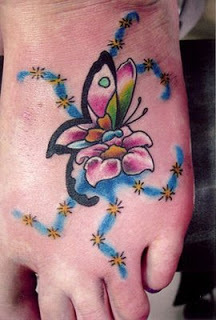 The butterfly tattoo also has different meanings in different cultures. For e.g., in Japanese culture, a butterfly personifies one’s soul. It also has the similar meaning in Greek culture. On the other hand, in Chinese culture, a pair of butterflies symbolizes love between two people. Just like the butterfly soars freely in the air, it signifies the journey of the soul. 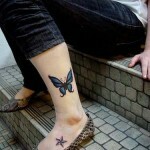 Butterfly tattoos also stand for instability of the life on the earth. Some people also believe that the life cycle of the butterfly to be similar to that of human beings. You can have a butterfly tattoo on any part of the skin and it will never fail to look great. 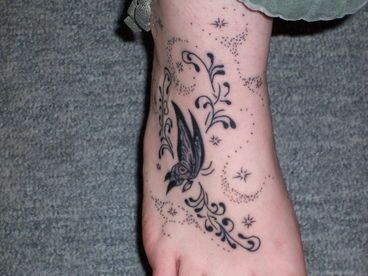 Tattoos on foot have many advantages. 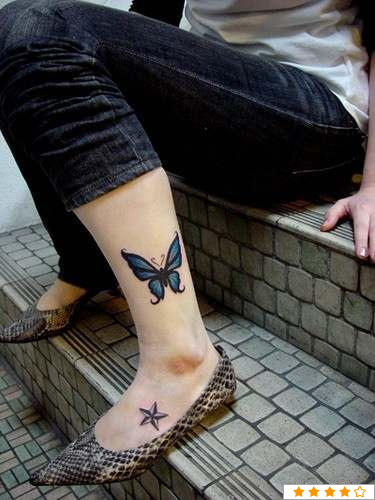 You can either have small butterfly tattoos on foot, or a butterfly mixed with other designs drawn up to your ankle or even shin. 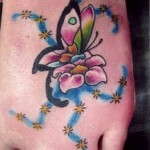 Imagine your colorful and delicate tattoo peeking out of your cool footwear! Another advantage of this tattoo is that you can flaunt or hide it whenever you want. 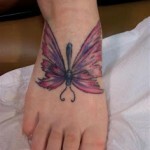 There are infinite butterfly foot tattoo designs to choose from. You can even be creative and create your own designs. 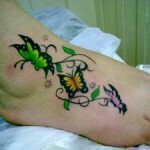 Sometimes women also have a combination of butterfly and floral patterns together to enhance the beauty of the tattoo. 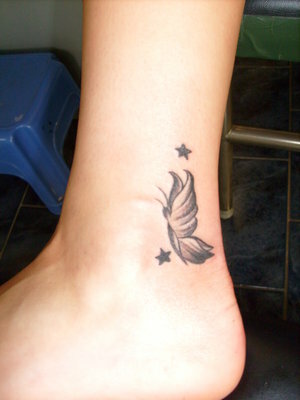 Similarly, you can try out different tattoo designs and colors, as the sky is the limit. 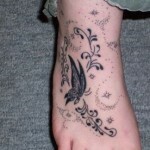 Celtic butterfly tattoos are very common and in great demand. One should have a serious consideration before getting a tattoo on any part of the body. Sometimes, there can be instances of infection or even of ink migration. On the other hand, it is advisable for diabetic people not to have tattoos made on their foot as it can affect blood circulation in the foot. 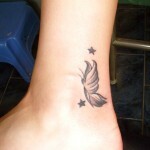 One should also keep in mind that tattoos can be painful and sometimes very difficult to get rid of. 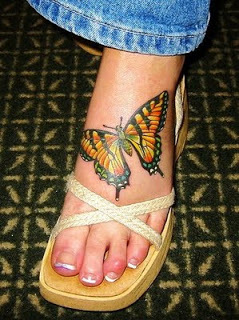 Whatever may be your reasons, butterfly tattoos on legs and feet will always look beautiful and stylish. If you are truly into it, just go ahead and flaunt your graceful tattoo.